THIS IS A COMMUNITY ITEM! The Predator 12G shotgun is a primary weapon available in PAYDAY 2 that was added in Update #43. It is a community item available to players who have joined the Official PAYDAY 2 Group on Steam. The Predator 12G is a heavy semi-automatic shotgun with a reasonably high rate of fire with reasonably respectable damage. It has a decent ammo pickup rate (4-7 with perk deck boost) and it can kill even moderately strong enemies with a single shot, headshots combined with the right perks and or mods downing even tougher enemies including MFR's on Overkill difficulty or below (and potentially multiple tightly packed enemies at once), therefore players who aggressively engage in close quarters combat should have little trouble maintaining its ammo supply. However, at the worst of times, even the best of heisters will have a hard scavenging for ammo so it is very important to manage it well and aim at targets where you know you can return to pick up ammo. See Shotgun Ammunition for pellet count and damage falloff statistics. As with all shotguns (lower-damage shotguns in particular) both Overkill and Shotgun Impact Ace are strongly recommended. 000 Buckshot is recommended for general combat use. The Predator boasts a large magazine capacity when modded. Thus, one of its effective uses is a crowd control weapon by loading it with either HE or Dragon's Breath rounds. This however, should only be done if one has an effective secondary weapon to fall back to for general combat, as the Predator at this point becomes too situational for all-rounder combat. Due to the Predator's low base (and limited maximum potential) Concealment, gearing it towards a high-Concealment build is inadvisable due to it having to sacrifice most, if not all, of its vital combat enhancements. A practical setup of the Predator is a high Damage and Stability one, since high Accuracy is not very important for a shotgun. Without the bonuses from perks and skills, this build offers a total Damage rating of 68, a Stability value of 76, 34 Threat and 10 shells per magazine. Accuracy (20) and Concealment (6 to 8) are both low. Stat increases/decreases from custom ammo types are not accounted for. Using Flechette rounds with the above build will reduce the Predator's damage by 3, but approximately doubles the weapon's range in return, increases Accuracy by 8, does not compromise the weapon's max ammo capacity and gives it the ability to pierce the heavy body armor used by Maximum Force Responders, making headshots less of a necessity. 000 Buckshot can be used to greatly increase damage by 15. Shotguns loaded with 000 Buckshot in game fire the same number of projectiles as they would if they were equipped with 00 Buckshot, despite the fact that these shells hold less pellets in reality due to them being bigger than standard. Equipping a shotgun with HE Rounds creates a makeshift grenade launcher, with a significantly smaller and weaker explosive effect that can be used to quickly destroy basic wooden doors, blasting them into fragments with a single hit. Gameplay-wise, it is rather pointless to use HE Rounds in conjunction with a silencer, since the shot is silent while the resulting explosion is not, and thus will still cause it to be heard. However, it can be used in conjunction with the The Professional aced skill in order to remedy the hefty accuracy penalty that HE rounds applies when used. It can be also used for comedic effect. In reality, flechettes do not always increase a shotgun's effective range. They do, however, marginally improves pellet grouping due to the flechettes' aerodynamic shapes while also offering a limited degree of armor penetration, and markedly increased accuracy down range in the case of tungsten carbide flechettes. The armor piercing effect is only noteworthy on personal body armors, though, as specialized plates and reinforced steel shields are usually dense enough to stop the projectiles dead in their tracks. Using AP slugs turns a given shotgun into a quasi-sniper rifle, as the shots no longer spread and are instead focused into a single target, albeit with worse damage fall-off. Printed onto the casing of every AP Slug is the line "G4G3", which is leetspeak for "Gage". Not compatible with the Shh! and The Silent Killer Suppressor. The usage of Dragon's Breath shells with semi/fully-automatic shotguns in the game is highly unrealistic, as the real-life equivalent of these shells are specialized low-pressure shotshells, thus will not produce enough gas pressure to operate a full cycle. These shells are realistically used with manual-action (pump, break, lever, etc.) shotguns only. The behavior of the Dragon's Breath shells in-game was most likely based on the misconceptions surrounding the ammo type that are commonly featured in videogames. Unlike standard buckshots, Dragon's Breath shells do not fire any "real" projectile out of a shotgun's barrel, they turn the shotgun in question into a mini-flamethrower instead. The chemical packets are ruptured and ignited when the weapon is fired, and produces a moderate fireball that exits from the barrel instead of flammable pellets like portrayed in-game. Due to their tendency to foul the breech and barrel of the shotgun with chemical residue, Dragon's Breath shells are impractical to utilize as they can impair the weapon in question's performance after prolonged use. The Shark Teeth Nozzle is based on the Tromix Shark Brake Door Breacher. Not compatible with Dragon's Breath Rounds. This suppressor's shape and appearance, along with its related achievement, is a nod to the suppressed shotgun carried by Anton Chigurh in No Country for Old Men. It is unclear in what manner is this suppressor, or any Barrel Extension for that matter, attached to the muzzle of most shotguns in the game as none of the available weapons of that type have external barrel threads. The King's Crown Compensator is based on the shotgun breacher attachments produced by King Armory. The Shh! is based on the SilencerCo Salvo 12 shotgun suppessor. The Donald's Horizontal Leveller is based on the Paradigm SRP Gator Shotgun Spreader. The modification's name and associated achievement are references to Donald Duck. This is the first modification to directly affect the pattern of a weapon's projectile spread, instead of simply increasing or decreasing the size of it. A comparison of an unmodified Reinfeld 880's spread and that of one with the Leveller. Special Effect(s): +3% Experience & money reward for you and your crew. To activate Gadgets on PC, press "Q". To activate Gadgets on Console, press down on the "D-pad". The Assault Light is based on the discontinued SureFire M961XM07 Millennium Universal Weapon Light. The LED Combo is based on the Leapers, Inc. UTG LED Weapon light and Laser. Although the main flashlight has a toggle switch, the laser sight component of the LED Combo is pressure-activated, meaning the laser will stay on as long as the pressure switch is depressed. This switch is not placed where it should be, however (on foregrips, magazine wells, etc...) and is instead ziptied to the main taclight, leaving no plausible mean for the user to toggle it without awkwardly moving their off hand off the weapon and gripping the attachment itself. Requires a pre-installed sight mod to mount. The magnification level can be changed while aiming down the sights, and the aiming FOV will automatically adjust itself. Not compatible with the Acough Optic, Military Red Dot, Milspec Scope, Combat Sight, Reconnaissance Sight, Theia Magnified Scope, Box Buddy Sight, the JP36's Original Sight, the Raven's Flip-up Sight or the GROM and Platypus 70's iron sights. Currently bugged and not appearing as intended on certain weapons, for a list see here. They're still listed below even if broken. Shows incompatibility with the Deagle's Marksman Sight, however they are allowed to be installed simultaneously. 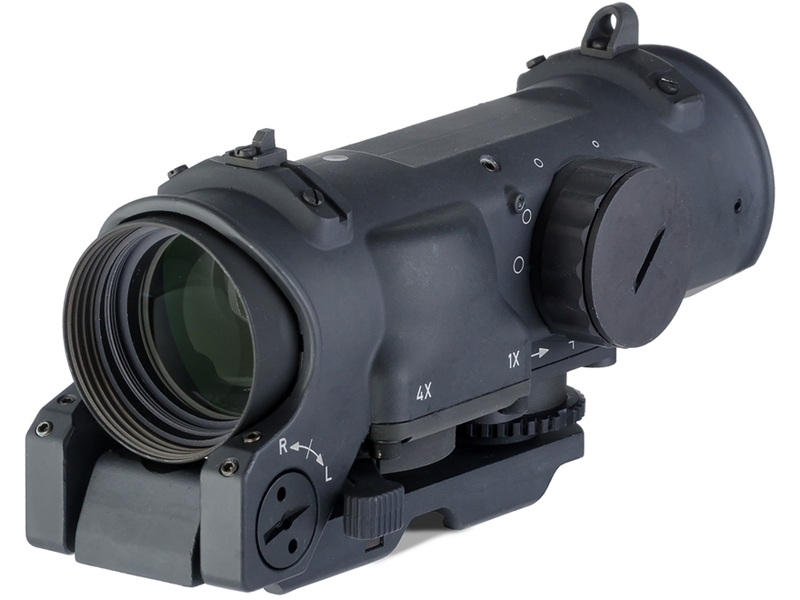 The Riktpunkt Magnifier Gadget is based on the Aimpoint 3XMag attached to a toggle mount. Despite this, the mod's asset file name suggests it was based on the EOTech XPS G33 instead. The magnifier will toggle on and off by itself when in use without any visual input by the player character. The JP36 carbines wielded by the GenSec Elites have this gadget installed in conjunction with a Compact Holosight, however it didn't become a player-usable item until 2017. For a comparison between sight looks ingame, check here. The Professional's Choice Sight is based on the Aimpoint Micro T-1. This modification is actually a sight + mount combo, consisting of a Docter red dot optic atop a LaRue Tactical Pride-Fowler MRD base. The See More Sight is based on the C-More Railway sight. The trademarks on the side is spoofed into "Sey-More". This sight can be seen attached to the UMP45 submachineguns fielded by the GenSec Elite SWAT members. The Combat Sight is based on the Aimpoint CS Red Dot Sight. This modification seems to have been based on a Sightmark Sure Shot, though altered somehow as it has a perfectly vertical lens frame while the supposed base model had a slightly-trapezoidal one. The Trigonom Sight is based on the Trijicon RX01 Reflex Sight. The Holographic Sight is based on the EOTech Model 516. The Compact Holosight is based on the EOTech Model XPS2. The Solar Sight is based on the Trijicon RX30 Reflex Sight. Upon release, the default reticle of this sight was a chevron instead of the retail version's red dot. After the release of the Gage Mod Courier DLC, it was reverted to the regular sight's red dot. It is functionally the same as the standard Military Red Dot Sight, but the sight's casing is tan instead of black with the line "A-10" scrawled on near the adjustment knob. The sticker on the lens cap's interior also says "I <3 Payday" instead of having a picture of an American flag. This sight was based on the Aimpoint CompM2 optic. While it is portrayed as a high-zoom scope in-game, the CompM2 is actually a reflex sight, meaning it offers no magnification in reality. This sight was based on the Aimpoint CompM2 optic. While it is portrayed as a high-zoom scope in-game, the CompM2 is actually a reflex sight, meaning it offers zero magnification in reality. The Milspec Scope is based on the ELCAN SpecterDR Tactical Rifle Scope. Does not actually appear properly for the Jacket's Piece. *The Acough Optic Scope is based on the Trijicon ACOG. The Reconnaissance Sight is based on the NcSTAR Advanced Dual Optic, but instead of an integral flip-up reflex sight, the in-game model has a rangefinder. Normally, the folding stock of the SPAS-12 would have a spring-loaded butthook attached to the end of the buttpad to assist with firing the shotgun one-handed. The butthook is absent on the in-game modification to provide a cut-out for the player to aim through. The Solid Stock retains the Predator's default ball-bearing latch above the pistol grip despite there being no folding stock to actually lock into it. Ironically, despite removing a decent chunk from the weapon, the No Stock is the most expensive option in its category. Janissary refers to Ottoman Empire elite infantry unit established in the late 14th-century. The Anti-Life skin may be a reference to the video game Half-Life, which includes the SPAS-12/Predator 12G as a weapon. The Predator 12G is based upon the Franchi SPAS-12, a heavy dual-mode combat shotgun capable of firing either semi-automatically (by gas-blowback) or by manual operation via the traditional pump-action. The "Predator" moniker is likely a nod to Jurassic Park, where the SPAS-12 is prominently wielded by various characters against the movie's Velociraptors/apex "predators". Despite operating in semi-automatic mode in-game, the position of the Predator's foregrip actually depicts the shotgun in pump-action mode. A real SPAS-12 would have its foregrip locked forward and protruding from the weapon's heatshield when switched to semi-automatic operation. This is also acknowledged by the indicator lines on top of the Predator. Attaching a gadget to the Predator fixes a rail mount to the underside of its foregrip directly on top of the mode-switching button. For whatever reason, the Predator's bolt does not lock back when running dry as it should in reality. The Predator's reload is also unrealistic, as the reloader will simply jam more shells into the tube without holding the release button on the side. Not keeping this pressed prevents the feed elevator from moving, thus obstructing the feeding port until moved. Upon closer inspection it appears that the Predator seems to lack this part entirely. The in-game Predator was likely based on the pre-1989 version imported by F.I.E. Arms, as evident by the lever-type safety. The ones sold by American Arms post-1990 have button safeties instead. However, the default magazine tube length of the Predator was only introduced on the 1990 imports by American Arms following the weapon's rebranding for sporting purposes. The Predator lacks the later SPAS-12's iconic swivel butthook, which could have been removed to facilitate the use of iron sights when the stock is folded. Ironically, the Predator 12G is the cheapest shotgun in the game at $42,000. In reality, relatively few were produced (about 37,000), of which only 5% (about 1,850) were imported into the US market. Furthermore, since Luigi Franchi S.p.A put its SPAS-12 production on hold in the year 2000, the retail unit cost gets elevated even higher. At the time, a typical unit cost an average of $450 when sold in the US, and recent auction prices have been reported to be $1,500 and upwards. As such, a black market SPAS-12 would be considerably more expensive. The Predator 12G is one of two semi-automatic shotguns in PAYDAY 2, the other being the M1014. The right side of the Predator's receiver says "PREDATOR 12G," "HEAVY DUTY SHOTGUN," and "MADE IN ITALY." Payday Wiki is a FANDOM Games Community.